This group includes the oldest known lycophytes (Banks, 1960). In some treatments these Devonian plants are regarded as prelycopsids and classified based on their stratigraphic position and lack of some typical lycopsid characters (Gensel and Andrews, 1984), whereas in others they are considered as transitional between the zosterophylls and the true lycopsids. They represent a diverse collection of presumably herbaceous plants, although anatomical details and complete specimens are not known for all taxa. The upright axes have exarch primary xylem maturation and bear helically arranged appendages that sometimes appear to be in a near-whorled or pseudowhorled pattern. These appendages are either non-vascularized or partially vascularized, that is, the vein runs into the proximal portion of the appendage, but does not extend through the entire structure, so in this way they are similar to microphylls, rather than being true leaves. The appendages do not dichotomize at their tips as do microphylls in the Protolepidodendrales, but this may not be a sufficiently well-defined character, as it can vary with preservation. Fertile specimens suggest that sporangia are not aggregated into cones. In contrast to the true lycopsids, the sporangia of most Drepanophycales are not borne adaxi-ally on sporophylls, but rather arise directly from the axis shortly above an appendage, that is, in an axillary position. The lack of definitive information on this feature, however, has been used to suggest that many of the fossils are better placed in the Lycopodiales (Bateman, 1996b). All members are homosporous. One of the oldest lycopsids is Baragwanathia (FIG. 8.1), known from the Siluro-Devonian rocks of Australia and the lower Middle Devonian of Canada (Lang and Cookson, 1935; Hueber, 1983; Garratt et al., 1984; Rickards, 2000). Baragwanathia longifolia is similar to a modern Lycopodium or Huperzia in that it had dichotomous branches that bore small, closely spaced, helically arranged appendages. 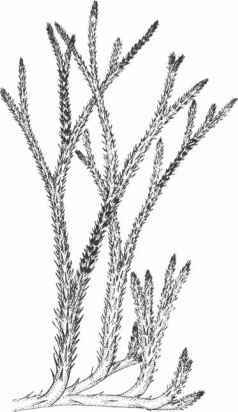 The plants are much more robust than those of Lycopodium, however, with stems reaching 6.5 cm in diameter and appendages up to 4 cm long. Associated with some of the appendages are reniform sporangia that produced trilete spores 50 pm in diameter. 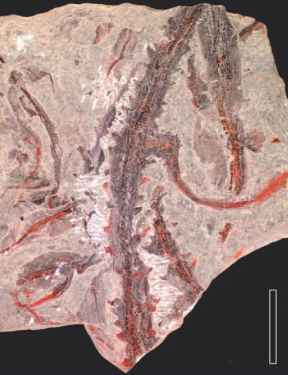 The compressed nature of the fossil material makes it difficult to determine whether the sporangia are attached to the upper surfaces of the appendages or borne on short stalks in the axils of appendages. The stele is stellate in cross-sectional outline, and the exarch xylem has annular tracheids. Baragwanathia abitibiensis is based on fossils from the Emsian (Lower Devonian) of Canada and consists of axes up to 3.2cm in diameter with helically arranged, microphyll-like appendages that bend downward (Hueber, 1983). Anomocytic stomata are randomly scattered on the appendages, but are far more common on the stems. The exact configuration of the xylem cylinder could not be determined, but the stele is constructed of tracheids with both annular and helical wall thickenings that closely conform to the G-type wall thickening. Sporangia were not found on any of the specimens. One interesting feature of B. abitibiensis is the truncated end of the mature appendages. It is believed that this unusual tip morphology is the result of postmortem changes. A similar cause may be used to explain the truncated or cup-tipped spines that have been described in some zosterophylls and trimerophytes. depressed horizontal or circular areas that denote the position of the appendages still in place. Microphyll-like appendages up to 2 cm long were borne in a shallow helix. Stomata have been described as occurring randomly among elongate, polygonal epidermal cells. The stomatal apparatus of D. spinaeformis is the paracytic type, consisting of two guard cells and two reniform subsidiary cells surrounded by a ring of epidermal cells that vary in number. Permineralized axes of D. spinaeformis reveal a lobed, exarch protostele ~2 mm in diameter. Individual tracheids are —70 pm in diameter and > 1 mm long. Secondary wall thickenings are annular-helical and possess a perforated reticulum in the position of the middle lamella (Hartman, 1981), now interpreted as G-type thickenings. Within the genus, sporangia are borne in either an axillary position or adaxially on appendages. Little is known about the spores, although the plants are regarded as being homosporous. 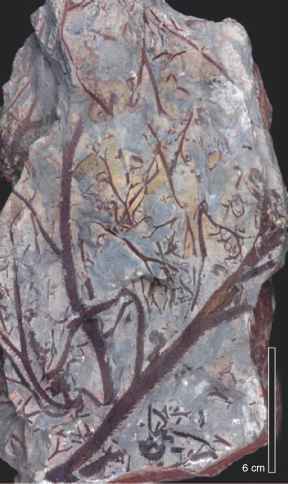 figure 9.5 Drepanophycus spinaeformis (Devonian). Bar = 2 cm. include a lobed, stellate protostele with annular trac-heids and a perforate reticulum similar to that in D. spinae-formis (Grierson and Hueber, 1968). Drepanophycus gujingensis is a species from the Emsian of Yunnan Province in China (C.-S. Li and Edwards, 1995). It has sporangia attached to the stems by short stalks and adventitious roots attached to both the fertile and sterile axes. 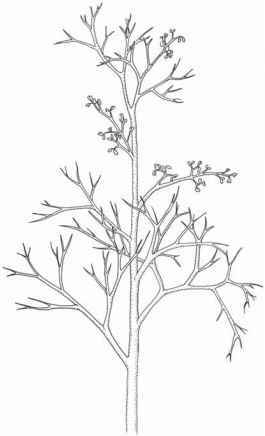 The stalked, adaxial or axillary sporangia are considered to represent an intermediate feature between plants like Asteroxylon (discussed below) and later lycopsids with sporangia borne directly on sporophylls. Another early lycopsid that is morphologically similar to Drepanophycus is Halleophyton (Early Devonian of China). It has rhomboidal to hexagonal swollen leaf bases and sporangia that split into two equal valves (C.-S. Li and Edwards, 1997). microphyll-like appendages are simple and possess subhexagonal bases (Gutiérrez and Archangelsky, 1997). helically arranged and densely spaced, short microphyll-like appendages. Often found in association with the spiny A. elberfeldense axes are narrower, dichotomously branched, naked axes of the Hostinella hostimensis type (sometimes misspelled as Hostimella), which were originally believed to represent the terminal portion of A. elberfeldense (Krausel and Weyland, 1926). Fairon (1967), however, demonstrated that these axes do not belong to A. elberfeldense, but rather represent a different plant, for which she introduced the name Stolbergia spiralis. Although superficially similar to A. mackiei, the systematic affinities of A. elberfeldense remain unclear. Anatomically preserved specimens from the Middle Devonian of the Aachen region in Germany suggest that A. elberfeldense, as well as S. spiralis, belong to the lycophytes (Fairon, 1967). Hestia eremosa is a putatively herbaceous and phyloge-netically primitive lycopsid with uncertain affinities that has been described based on isolated stems from a Mississippian sequence of tuffs and lacustrine deposits at Oxroad Bay, East Lothian, Scotland (Bateman et al., 2007). Stems are characterized by the combination of a stellate stele, scalariform xylem pits, and perforate sheets of wall material partially infilling the pits, a complement of features largely consistent with that seen in Huperzia, the most plesiomorphic extant genus of Lycopodiaceae. The limited number of characters preserved in the fossils, however, cannot preclude placement of H. eremosa within the Drepanophycales. An excellent example of a lycopsid that possesses characters of several groups is Smeadia (FIG. 9.8) from the Upper Devonian Cleveland Shale of Ohio (Chitaley and Li, 2004). This plant was herbaceous with a siphonostelic stem (FIG. 9.9) and helically arranged leaves. At the distal end was an erect stro-bilus (FIG. 9.8 ) that contained trilete spores 40-80 pm in diameter.